This week I’ve been in a real reading slump. After finishing A Natural History of Dragons, I really couldn’t decide what to read next. I tried several books including L. E. Modesitt Jr’s The Soprano Sorceress, Star Wars: Heir to the Empire by Timothy Zahn and Graphic Audio’s full cast rendition of Brandon Sanderson’s Hero of the Ages, but none of them hit the spot. I was more interested in watching Animal Planet’s Cat Daddy. Incidentally, this week Jackson Galaxy’s autobiography, also called Cat Daddy, was one of Audible’s Daily Deals so I was happy to pick that one up. It’s narrated by Jackson himself, so could be a very good listen. 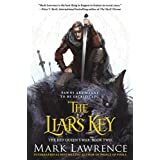 Finally I was able to break my slump by picking up Mark Lawrence’s The Liar’s Key. This is the second in his Red Queen’s War series and continues the story of Jalan and Snorri. This series is set in the same world as The Broken Empire, and I adored the worldbuilding. I’m really enjoying this book so far – I’m just under half way through. So far I’m not seeing quite the same character development in Jalan as there was for Jorg in The Broken Empire series, but I’m still hooked on his adventures. Other than Cat Daddy, I placed a preorder for Erica Johansen’s Invasion of the Tearling. Now, my impression of the first book in the series wasn’t very positive. I had some serious issues with the worldbuilding and had decided not to continue with the series. However, I recently saw some blurb/reviews which indicated that Johansen had specifically addressed these issues and in a rather intriguing way. It was enough to convince me to give the series another chance. Interestingly, the audiobook is narrated this time by Davina Porter, who narrates the Outlander audiobooks, so my preorder has been placed with Audible. This will be the first time I’ve listened to a non-Outlander audiobook narrated by Porter, so it will be interesting. Enjoy your weekend and I’ll update you next week.